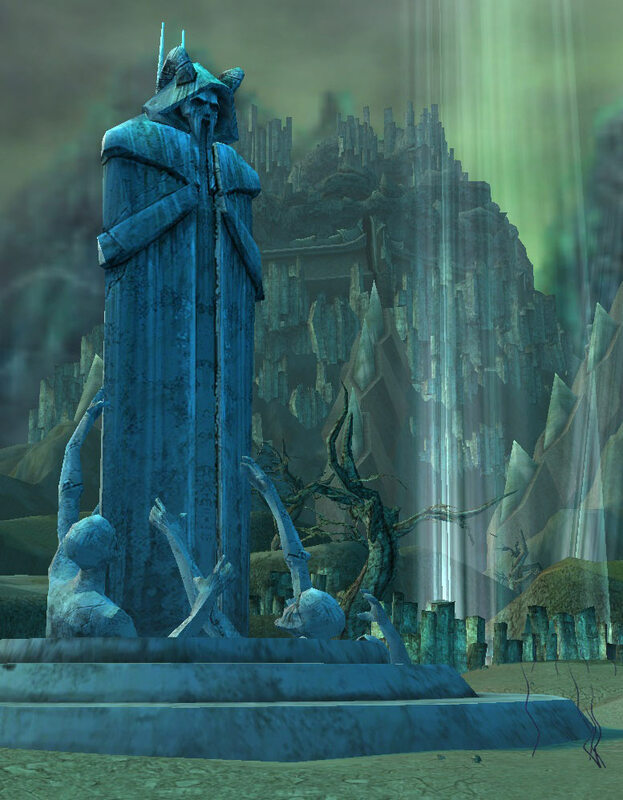 If you have not yet seen the Wayfarer’s Reverie quests in Guild Wars, do yourself a favor and go check them out. Not because you get a Tormented weapon for completing them all…but because it’s a lovely, nostalgic look back at a game that many of us played for years. I don’t think I spent an entire day in GW1 since I completed vanquishing Cantha – it’s been well over a year. I’ve completed the things I want to do, I’ve bought the items and armors I want, I’m at 45/50 in my Hall of Monuments, and I’m happy with that. And yet that’s what I spent my Saturday evening and all day Sunday doing – playing Guild Wars. And I can’t remember the last time I had so much fun doing so. 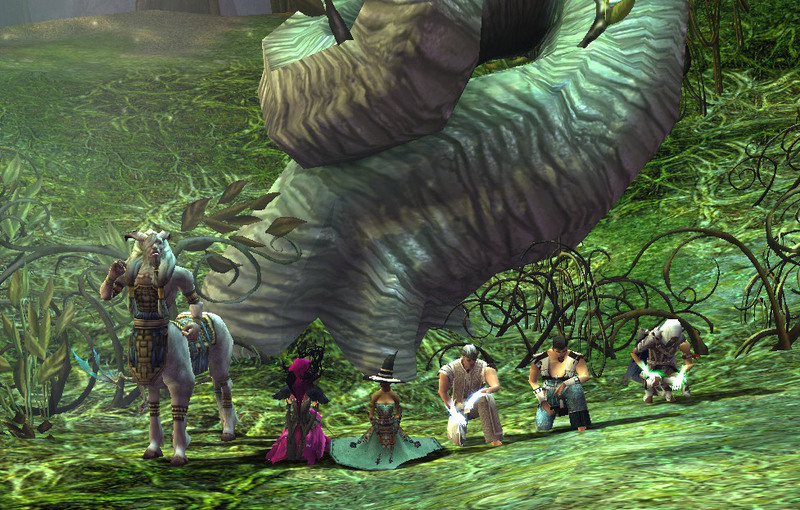 Several members of my guild for GW2, I Can Outtweet a Centaur!, met up to do the Wayfarer quests. We had fun. We did stupid things while running from point to point. We spent 45 minutes failing at an easy dungeon because we wanted treasure. We sat under the Pale Tree, made jokes about all sorts of inappropriate things, and hung out in Eye of the North dancing while using hero tonics. And thanks to one of our guild members accidentally recording two hours of gameplay (and filling his harddrive in the process), we’ll have this on video forever. We decided to do Fissure of Woe on Sunday afternoon. I had decided that I wanted to send off my oldest GW character, my Ranger and my nickname’s namesake with a set of Obsidian armor. I helped finance sets of Obby for three other guildies so that they could get the points for their HoM. This completely wiped out the remainder of the money I had in-game, but it was more than worth it. Almost anything would be worth having so much fun with such an amazing group of people. But one thing that most of us realized during all of this…this is likely the last time any of us will really play GW1. We’ll still log in for events and the like, I’m sure, but the days of playing all the time are over. While this is because of Guild Wars 2 launching in a week and headstart being in just over four days…it’s really kind of sad. The GW-EN farewell party refered to it as an end of an era, and really…I can’t think of any better way to describe it. There will never be another game like Guild Wars again. It really was a one of a kind thing, a very unique sort of game. But sometimes it’s time to move on. There reaches a point where you’ve done everything in a game, and it no longer holds the appeal it used to. I will always love GW1, but it will never again hold the same sense of wonder and amazement that it used to. It’s time for Guild Wars 2 to prove itself. And so I say to you, my dear Guild Wars, farewell. And even if I don’t log in frequently, I will never stop loving this game. To everyone I have met because of this game – thank you, for so many things. You are all amazing. I will see you all in Guild Wars 2 this weekend. Kel (@ebonywolf21), Optimus Maleficus (@mr_ex, Malefic Incantations), AJ (@AJWolf84, The Lore Wolf), and myself. Five years now, since Guild Wars 2 was first announced. Now, I haven’t been following it all that time. Five years ago, I had barely heard of Guild Wars at all – it was this game my brother and one of his friends played. My main memory of it at the time was my brother tackling his best friend in my store because his friend bought him a copy of Factions. I thought it looked interesting, but the whole “online game” part of it put me off – at this point I’d already tried both WoW and FFXI and hated both, so I wasn’t much into the idea of another MMO. He got really into it, and told me I had to try it. I decided, okay, I’ll give it a go. I made an Elementalist in Prophecies and played a bit, and it was decently fun, but didn’t grab my attention. So I left it. About a year later, during the fall of 2008, a friend of mine started playing it. And got really into it. And insisted I had to play it. At this point, Prophecies was $20, so I decided why not. I’ll give it a go again. However, disaster struck – my mom’s computer decided that after running the game fine for ages it would no longer do so (and I had support completely baffled trying to figure it out), and my own computer was so old that it couldn’t run the game at all. My computer was also old and crappy enough that upgrading it was not an option. After a month or two of irritation, I managed to buy a second-hand computer from another friend and hurrah! I could run the game! And history was made. Prophecies still had a hard time drawing me in, but a coworker bought me Factions for Christmas, and that was it, I was hooked. I bought myself and my brother both Nightfall that year just after Christmas. I got Eye of the North not much longer after that. I talked about it enough that my boyfriend bought the Platinum edition, and then I bought him a copy of Factions. When helping out at another store, I discovered they still had a Nightfall CE – and it was only $10! I bought it in a heartbeat. I managed to get the Factions CE online. I fell in love with the Dervish profession, and my Dervish became my main. Then two things happened in pretty quick succession – the Guild Wars 2 announcement at gamescom in 2009, and me getting into twitter. My first steps into actually becoming a part of the community began when I joined GuildMag as a designer for the magazine. My actual stint as one was rather on and off, and eventually I had to step down entirely as I simply did not have the time for it, but if not for that, and deciding to give twitter a try (I’ve had my account for ages but used to hate twitter) and following the other GuildMag members, I would not be writing this blog today. The twitter community for Guild Wars and Guild Wars 2 is amazing. Optimus writes a bit about it in an entry posted yesterday about the guild we’ve set up (which somehow I wound up as leader of! ), but it was my slow involvement in the twitter community that gave me the idea of starting a blog of my own. Many of the people I had followed and became friends with were bloggers, and I enjoyed reading what they wrote, and I had plenty of ideas and thoughts of my own – so why not give it a try? 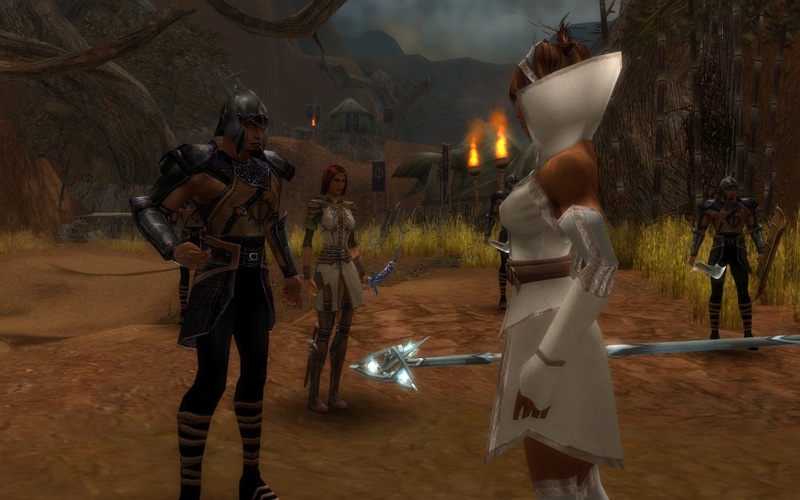 At this point, when I decided I was going to give blogging a try of my own, I’d been following Guild Wars 2 for almost 2 years. I’d heard of it before the announcement at gamescom, but there was precious little info. Still, I adored Guild Wars. Any sequel to it was something that would certainly pique my interest. Then gamescom 2009 came, and we got some info on it…and honestly, I was a bit put off at first! Persistent worlds? Oh, no! I loved how instanced GW1 was. I am, as a whole, not a terribly social gamer (which makes how things are now even funnier for me). I prefer to do things largely on my own, on my own schedule. I was also very wary of the idea of people coming along to screw up something I had been doing. I didn’t want to have to play with others people. And that hesitation remained right up until I actually got to play during the first BWE. Now I realize that I was silly to be so down on that fact. But at the time it was a genuine worry. I had fallen in love with the sylvari from the very first moment I saw them. I remember finding myself highly disappointed on how little they were ever shown and how little info about them we were ever given. When the redesign was announced, it made me even more impatient to see how they had turned out. I wanted to know their lore, what they believed, everything about them. I collected every bit of info about them that I could find, giving this blog a sylvari-themed name. 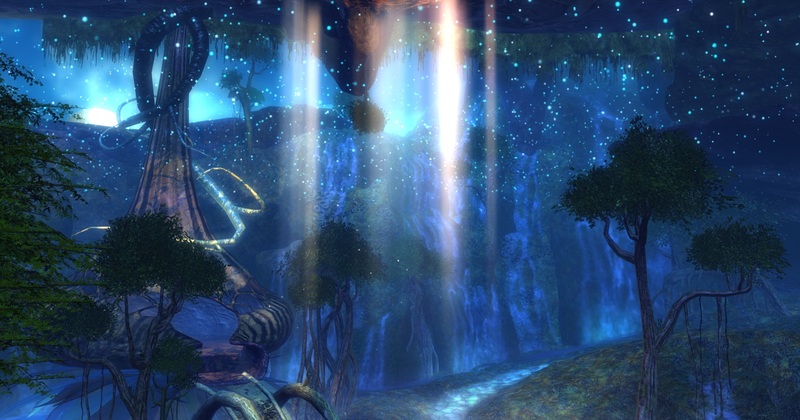 While, strictly speaking, my blog is not sylvari-themed (beyond the name and color scheme), there’s no denying I do write about them a lot, and I rather pride myself in my knowledge of them. And so in early 2011, I started up this blog. I began to write. I enjoyed it! 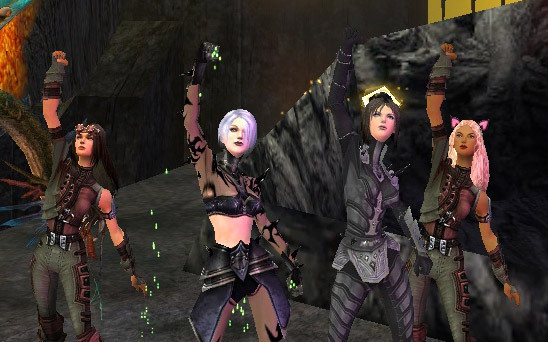 At first I wrote a lot about Guild Wars 1, and I didn’t really set out to have any specific goals about my articles. I just wrote because I had thoughts that I wanted to express. I didn’t ever really share the blog around much, as I’ve always been afraid of showing off my stuff, worrying that what I write isn’t good enough and no one will care. And then, one of my early posts was retweeted by ArenaNet. It’s probably silly, but that fact put me over the moon. People actually did want to read what I wrote! And on top of that, the people working on the game, thought that what I wrote was worth reading! At that point, I decided it was time to start taking blogging a bit more seriously. It’s been a long road, but I feel I’ve carved myself out a small niche. I’ve scored an interview with some of the writers for Guild Wars 2, I was invited to help give away keys for BWE3, and mine and Dak’s posts about BWE3 were linked to in an ANet blog post. As a fan, who does this because I love it and I love this game and community so much? Those things are amazing. I’ve made a lot of friends, all of whom are amazing, and we talk about everything under the sun. We decided to start up a twitter community GW2 guild during BWE3, and wound up close to 40 members just over the weekend, and we decided to keep it going at launch. I got Dak interested in blogging – something that he’d never done before, and now I giggle whenever he flails about his posts getting linked around, because not so long ago at all I was in the same position he was – just amazed and surprised by it all. And on top of that, blogging like this has made me realize what my real passion is. So, thank you, ArenaNet, for making a game that has inspired such passion in people, and has given me years of amazing memories while just waiting for the game to release – and is sure to give us years more while playing the game. 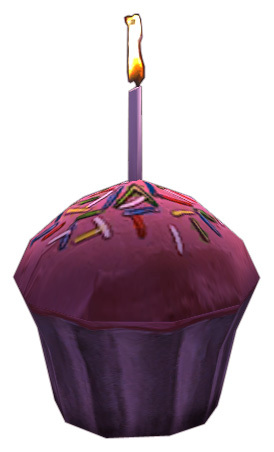 This entry is for the fourth GuildMag blog carnival, “Five years of waiting“. What more games should be learning from GW/GW2. Recently, I played the beta test weekends for Star Wars: The Old Republic. Now, before I say anything about the game, let me make it clear that I am a huge, huge Star Wars fan. I love Star Wars, I grew up with the movies, I’ve played most of the SW video games that have released and read a great number of the books. That said, I am not the sort of fan that holds something to a “can do no wrong” standard. I have no problems criticizing something I am a fan of. I’ve done it many a time before to things within the Star Wars universe. So, with that said. Did TOR live up to my expectations? Sadly, the answer is yes, as I didn’t have high expectations for it in the first place. Initially I did – I thought it looked amazing and that it’d be a blast…and then as they released more and more information about it, and it began to look more and more bland. And the final product just couldn’t be more generic. The entire time I was playing, I couldn’t help but constantly think “Guild Wars did this better”, or “Guild Wars 2 is doing this better”. Now, of course, most of these failings are just endemic to the MMO genre and are not unique to TOR – you could insert any game (WoW, Everquest, LOTRO, Rift, FFXI) in here for most of the points and it remain the same. TOR played up how it was going to be different a lot at first, though, and obviously fell way short of that. Not to mention the fact that with Star Wars? They easily could have afforded to branch out and do new things. Instead, they decided to go the safe route. So what were the glaring things I noticed that they could have learned to do better from GW/GW2? Don’t lock race/species selection to class. So, GW2 has eight professions and five races. TOR has eight professions and nine races. You’d think that TOR would allow more variety in what you can create? Well, you’d be wrong. Each class in TOR is limited to a choice between five races (for the most part, I believe one or two of them were limited to only four). A couple of the choices make sense – the Sith race and Rattataki being restricted to Sith/Imperial options, for example. But the rest? Initially it was justified in that your race would influence the starting story. However, as it has turned out…it doesn’t. The only thing I noticed was a single dialogue option in a sidequest if you were a Sith Sith (sounds redundant). That’s it. I myself had wanted to make a Mirialan Bounty Hunter, as I have an RP character that is a Mirialan bounty hunter that works for the Empire. Bounty Hunter is an Imperial character class. Score! Or, well, not. Because for some unknown reason, you cannot create a Mirialan Bounty Hunter. Nor can you make a Twi’lek Agent, or a Mirakulan Smuggler…and if you want to be a Sith Warrior? Hope you like humans. Whereas in GW2…while NPCs for the most part will only be of certain race/profession combos, for your character, you can pick whatever you want. 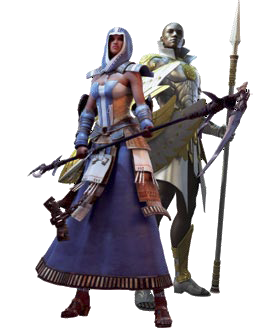 Want to make a sylvari Engineer, or asura Warrior, or charr Elementalist? Go for it. You’re not locked down to a specific role. Nor should you be. You’re playing as a hero, and heroes are allowed to defy the norm. Make the races actually look different. Oooooh boy. Now, in TOR, the races you can select from (human, Mirialan, Miraluka, Twi’lek, Zabrak, Cyborg, Chiss, Rattataki, and Sith pureblood) are all…very human-like. Cyborg is simply a human with some cybernetic mods, and the others are all either humanoid or near-human. Unfortunately, TOR also tends to keep the customization choices between them nearly the same…to see what I mean, here’s a video I made of the main character creation options. I did not record body type, complexion, eye color, or for most skin tone, and after a while I started leaving out scar options as they are the same across everything (except female Rattataki and male Twi’lek…which also have the same options). Now, compare that to GW2’s character creator…and keep in mind that this video is from the demo at Gamescom, and isn’t even close to what will be available upon completion. Across each gender, with only a few exceptions, the faces, hair, and scars are all the same. The only thing that differentiates, say, a human and a Mirialan is the skintone and tattoos. Cyborgs get some metally bits attached to them but otherwise are identical to humans. And the ones that do look the most different from humans have the fewest options available to customize them. Essentially, there’s nothing to set your character apart from another. The most annoying thing about this is that there are clearly models available of less humanoid races in the game – some of the NPCs I came across included Togrutas, Rodians, Nautolans, Kel Dors, Cathars…they’re just not available for play. 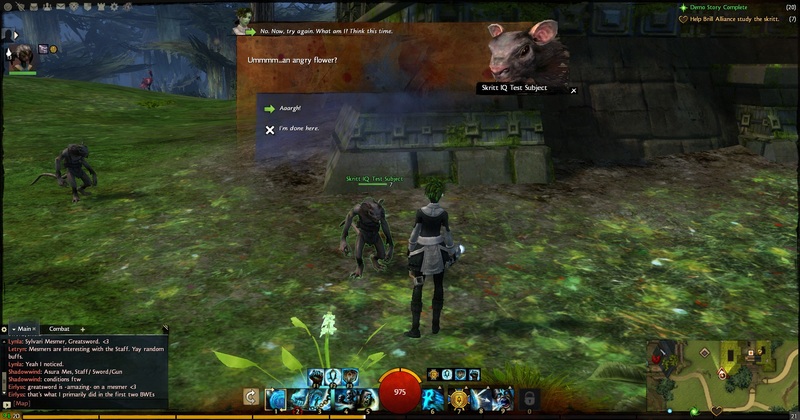 Whereas, in GW2…each race looks drastically different. They each have very, very different options for customization. And it will be very easy to create a character that stands apart from others. TOR’s gameplay is okay. It’s not bad. It’s not great, though, either. It’s just…very generic. Essentially, it plays exactly like WoW. There’s stuff everywhere for you to shoot at/hit with a lightsaber. Hit enough things, you go up a level. …okay, so every game ever basically plays that way. The problem with TOR is that the gameplay essentially does not ever change from that. Not only that, but you can go through everything just mashing the number 1 on your keyboard. Sure, there are other skills, but your most basic one, the first you learn, is strong enough to see you through pretty much anything. Enemy groups you also fight are nothing to write home about. Nearly every group is made up of three enemies, at a level where chances are likely you won’t have to break a sweat to kill them, and they never do anything special. They just shoot at or hit you until you kill them. The leveling mechanic is also quite dull – you level up, you go see your trainer to buy a new skill. You never have any options as to what you want to get, though. You’re just limited to one or two skills. Your class dictates your playstyle 100%, and the only time you get any real choice over this is when you hit level 10 and go to choose your advanced class. Then, you’ve got a few skill trees you can put points into. Choose wisely, though, as you cannot ever change your advanced class once chosen, and while you can re-spec your skill trees, doing so isn’t free and gets increasingly expensive. In Guild Wars, enemy groups tend to have at least some variety. They can vary in size – anywhere from 1 to about 8 or 9, vary in profession, even vary in species. Some can be very easy, some can be very hard. Sure, there are a lot of people who claim over and over that GW is easy…but it’s really only easy when you’ve been playing for a long time and know how to perfectly synergize a party build and take advantage of AI limitations. For most people, that’s not the case. Some of it can indeed be quite difficult. And while, sure, you can stick with the same build throughout…not even the vaunted Necro/Mesmer/Ritualist setup will work at peak efficiency everywhere. Leveling is also different, as we all know. It doesn’t really matter, for starters, and you hit max level fairly quickly. It gains you attribute and skill points, and you can spec your attributes any way you want and spend those skill points on any skills you’ve unlocked thus far. Changing your attributes and skill bar is easy and can be done at any time while you’re in a town or outpost; changing your secondary profession is equally easy past a certain point. Experimentation is encouraged and each person will wind up developing their own playstyle. Guild Wars 2 will be even more dynamic in this; the level cap is higher, but they’ve stated that when you’re at level 75 it won’t be any harder to gain a level than it was at level 5; it’s still not terribly important. You learn weapon skills by using a weapon a few times. And you can change your skills on the fly just by swapping to another weapon set – and in fact this will be a very important part of playing the game. Also, as far as the story goes, make it actually relevant to the gameplay. Fetch quests and “go kill x of y” are not fun. There’s the occasional fetch quest in GW, but for the most part, that sort of questing is absent from GW, because it’s pointless. The instancing in the first game made it so. TOR’s quests, though, all tend to boil down to just that. Make it feel like it matters that there are other people around. For all that TOR is an open world and there are other people running around everywhere, it doesn’t really feel like they actually matter. NPCs in the game will make comments like “Oh, it’s good to see another Padawan!” to you, despite the fact that there are…dozens of other Padawans running around, and oftentimes other players are just going to wind up being an annoyance or a hindrance to you, as you wait for something to respawn that someone else get to before you did. You can group up, but there’s really no point in doing so except for Flashpoints, which essentially require you to group, and nothing in the world reacts to others being around. Guild Wars 2 is not going to work that way. The dynamic quest system makes it so that the difficulty of a quest will change, depending on how many people are actively participating in the area. While there will be things like crafting and the like, you won’t have to camp out around a node waiting for it to regenerate for you to use; you can use it and it will still be readily available for the next person to come along. And no need to worry about someone coming along and ganking your kill (and loot!) – anyone that participates in a fight will get goodies, depending on how much they had participated. Make it seem like your actions actually mean something. TOR is a heavily instanced game; as each profession has it’s own storyline, this makes sense. But there is also no phasing to the game – everything else is 100% persistent. This means that what you do has no actual effect on the world. 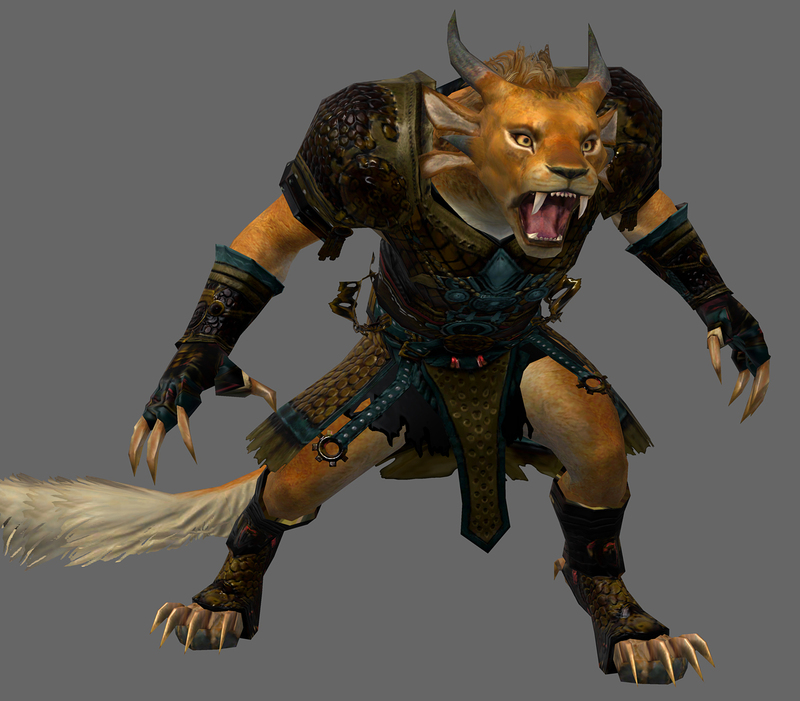 Kill as many fleshreavers as you want – it won’t ever make a difference. They’ll still keep coming. Guild Wars allows you some effect on your world – as it’s all instanced, things can be tailored to you. Completing quests can make it so that certain enemies do not ever spawn in an area again; active quests can make it so certain NPCs appear in an area while you’re completing that quest. GW2 will go even further with that, with the dynamic quest system. Stuff will happen and depending on how successful people are in responding, things will change and a new line of quests will spawn. Of course, these won’t necessarily be permanent changes, as that would be unfair on anyone who missed out (or if a particular quest was won, and people wanted to try the quest line spawned by losing that first one), but the effects of your actions will be seen pretty clearly. If you’re going to claim something, try and live up to it. TOR and GW2 are both games that have made the claim of being fully voiced. But…just how well do they live up to these claims? TOR is, indeed, fully voiced. What little that is voiced, anyway. Some random NPCs you go up to might have a line of greeting for you (much like the NPCs in Eye of the North). Most will just completely and totally ignore you. The only thing that’s really voiced are cutscenes. And, well, there are a lot of them. Every single quest you try and pick up or turn in means you have to go through a minute long (at least!) cutscene. Double that with loading times…and yeah, it gets tiresome. 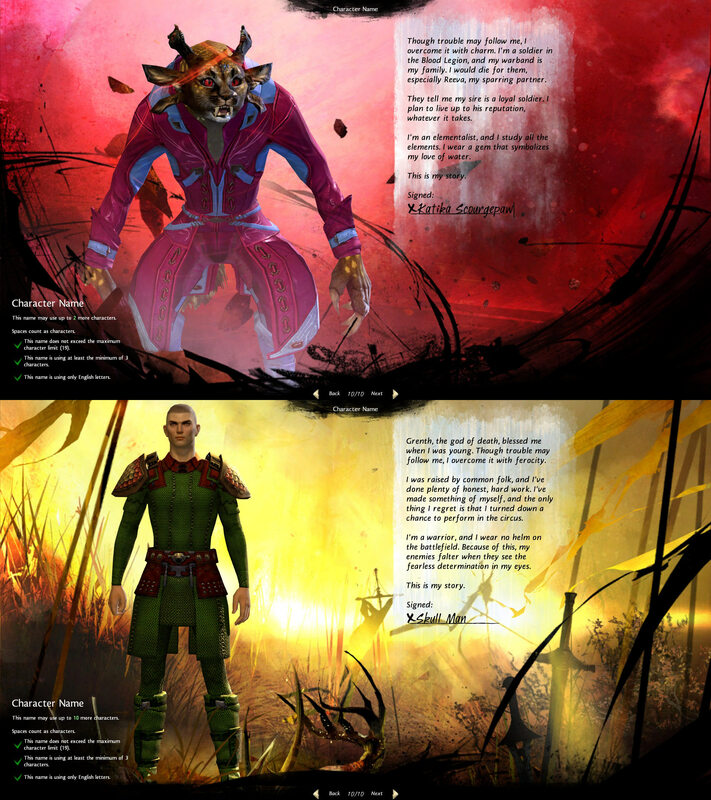 On the flipside, and this is where GW2 is really going to shine, I think, in TOR? I noticed almost no background chatter. During the smuggler starting quests I noticed some guys sitting outside of the spaceport that’d start (belatedly) chatting as you’d run by, but that’s it. Despite the fact that the world is actually quite populated (people everywhere, and not just players! ), it all felt very sterile. Certainly not alive at all. Compare that to GW2 videos that’ve been shown so far of running around cities and constantly hearing background talking and noise…there’s no doubt which game feels more alive. There’s probably more I could write about here. I barely touched the story aspect of the games, being as I didn’t really get far in the stories in TOR (the sidequests rather overwhelmed the main plot I found, anyway) and we don’t know too much about the plot in GW2 yet. And TOR did do some things well – while I dislike the standard “morality wheel” for your dialogue choices and a lot of the light/dark choices were very arbitrary and made no sense, they did have some great characterization available (several responses or conversations made me laugh out loud). But as a whole…it felt too much like things I’ve played before, and disliked. The MMO genre is stagnating, has been rather stagnant for quite some time. I believe that initially BioWare had intended to try and do something different with TOR, and while I don’t like them as a developer anyway, I do not believe they’re 100% responsible for the resulting genericness of the game; I feel that EA had a pretty big hand in that. At the same time, though, I just can’t help it. I look at what TOR could have been, the potential it had, and can’t help but be disappointed that it fell so short and they went for being just another clone. Combined with excitement over the new things that GW2 is aiming to do…and I think it’s pretty clear which game is doing the right things, and that more developers should be paying attention to and learning from. 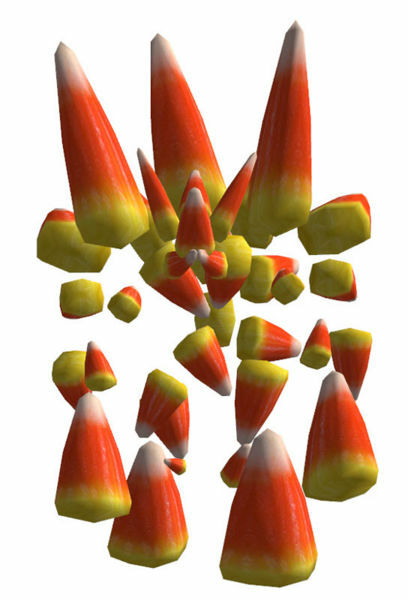 It’s (almost) that time of the year! The past few years on Guild Wars Guru, those of us that frequent the Nolani Academy subforum have participated in a community-held art workshop for both the Halloween and Wintersday art contests. The purpose of the workshop is not necessarily to try and win a prize in the official contest, though workshop participants are always well-represented amongst the winners; last year for the Halloween contest something like 9 of the 23 winners were workshop participants. Rather, the main point is to create a piece of art that the artist is happy with, to obtain critique, and to try and learn something new and expand on your artistic skills. And, obviously, the art is all both Guild Wars and Halloween-related, which lends to some awesome creativity in what people come up with! I participated in both workshops and art contests in 2010 (and was one of the contest winners for Wintersday), so I can attest to how much fun it can be to participate, and how incredibly helpful the critique that’s given out can be. It’s really a great time, with people of all skill levels participating (and winning prizes). We usually hold a party in-game afterwards where we all just hang out in an outpost, give out prizes, mess around, and have fun. This year I’m stepping up my participation; I will be hosting this year’s Halloween Workshop on Guru. The workshop itself isn’t open yet, but the thread is up, I’ve set aside a bunch of my goodies for prizes (I just need to divvy up what I’ve got between the categories), and I’m looking for judges and prize donations. And even though entries aren’t being accepted yet, discussion and brainstorming in the thread is more than welcome! If you’re interested in participating, want to help judge, have stuff you’d like to donate for prizes…just post in the thread or shoot me a message on Guru. And of course the most important part – have fun!